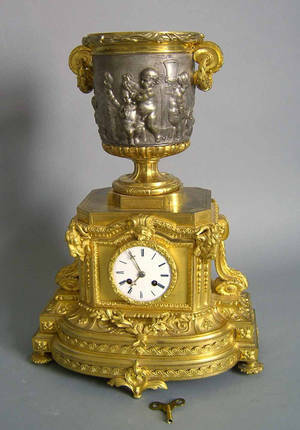 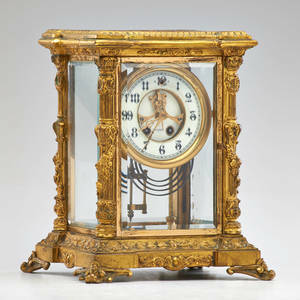 French portico or mantle clock with black lacquered case with four columns with gilt bronze leaf tip decorated capitals and bases surrounding a circular clock face with black roman numeral numbers and additional scrolled foliate, shell, and floral decoration in band around face and circular medallion within. 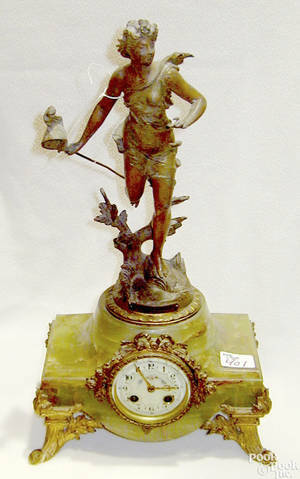 Hanging pendulum with similar motif. 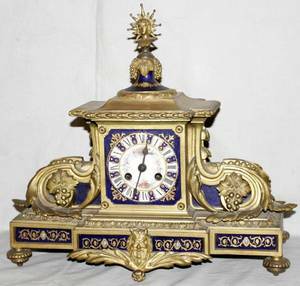 Entablature form at top and rectangular base with matching ribbon, feathered quil, and entwined leaved wreath mounts. 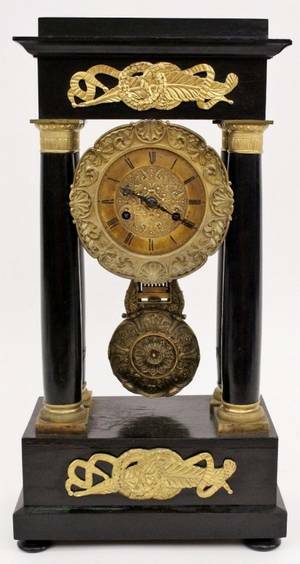 Back of clock mechanism with "M.J73" with additional "73" marks on swinging pendulum. 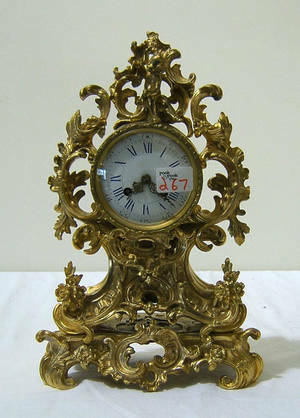 Height 18", width 9.5", depth 5.5". 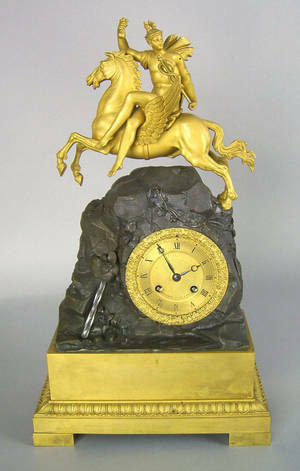 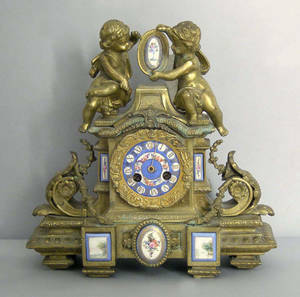 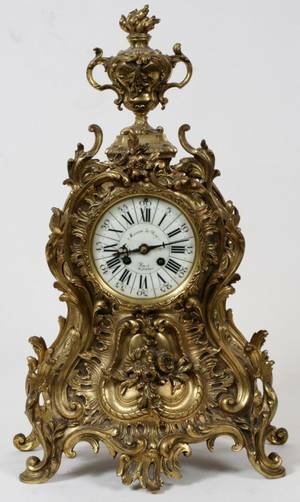 050050: FRENCH FIGURAL GILT BRONZE MANTLE CLOCK, H 27"
French gilt bronze mantle clock, early 19th c.
Waterbury clock company; gilt bronze mantle clock, san francisco, early 20th c.; movement marked "s.f. 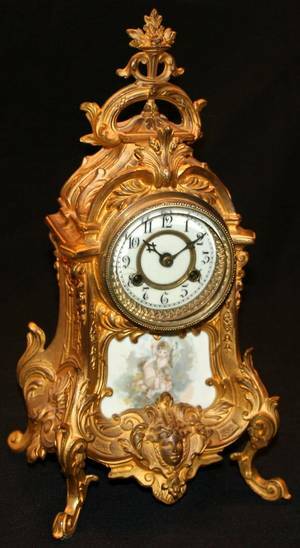 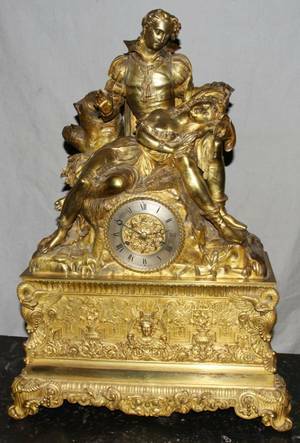 "; 10 1/2" x 7 1/2" x 6 1/2"
122458: WATERBURY GILT BRONZE MANTLE CLOCK, H15.5" W7"
French marble and bronze mantle clock, late 19th c.